Everyone knows that when you need a new or used Ford car or truck, you come to Bartow Ford. For 70 years, our dealership has offered the city of Bartow and surrounding areas everything the other dealerships can’t: quality service, a pleasant experience, and years of expertise. The cars and trucks aren’t bad either! 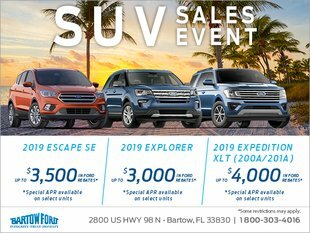 Here are three ways shopping at Bartow Ford is different. One of the things that make us a cut above the rest is our employees. When we started out, we had only 15 employees. Now, we have over 200 hard-working, loyal, knowledgeable individuals. They love working at our dealership because we treat each other with respect, grace, and always put forth a positive attitude. It’s how we work together, and how we work with our customers. Our employees are so happy to be here that they actually stay much, much longer as compared to other dealerships. On average, a car sales specialist remains in his or her position for 18 months. Our car sales specialists average tenure is seven years! The founder of Bartow Ford, Mr. Ernest Smith, once said, “Our first and most important obligation is to provide total satisfaction to each customer.” His message has stuck with us ever since, shaping the way our business runs. We offer guests a calm, no-pressure environment where they are put in control of their purchasing decision. Customers appreciate being treated with respect, which is why a huge portion of our sales are actually from repeat customers. At Bartow Ford, the car and truck buying experience is bar-none. Our goal is to ensure you are satisfied with our service when you get here, and to that end, there is nothing we wouldn’t do. If you’d like to witness how we run things in person, visit us in Bartow at 2800 US Highway 98 North, give us a call at 800 303-4016, or shoot us a message online.